The article discusses the pre-war period, the war, and its aftermath in the larger regional context of the Middle East and the Horn of Africa. The main premise is that new movements emerged in the decades prior to the war in this area. They redefined societies and politics, and did so in terms that would later herald modern nationalism in various forms. Some of these movements were led by newly educated young generation; some were of more traditional and of more religious nature. After discussing the military stages of the war in this arena, the article presents the diplomatic dimensions of the war. In general, the two rival European camps developed diplomatic dialogues with these various local movements. Commitments and promises, which turned out to be important in shaping the post-War history of the Middle East and the Horn of Africa, were made. The pre-War movements went from ideas to reality, and the new League of Nations was involved in this transformation. The case of Ethiopia was somewhat different. The Christian empire was independent before the war, and no foreign army invaded her. Yet the developments during the war affected Ethiopian history and the entire Horn. Moreover, in the longer run, post-WWI Ethiopia had a profound impact on global history. It was the only entity in the area in question to enter the League of Nations as an independent state. It was the beginning of a long story that culminated in the 1935 Fascists invasion of Ethiopia, the ensuing destruction of the League of Nations, and the global deterioration towards World War II. 1 This article is based on two of my books: Erlich 2010, 43-92 and Erlich 2014b, 21-102. 1Towards the beginning of the 20th century and in the years prior to the Great War, new self-definition movements emerged in the Middle East and Northeast Africa.1 Some were not to last long, but they all left their legacies. The Sanūsiyya led the Libyans.2 The Mahdiyya became a formative modern experience for the Sudanese.3 The movement of the sayyid Muḥammad ibn ‘Abdallāh Ḥasan (known by the nickname of “The mawla”) is arguably the mother of Somali nationalism.4 Ethiopia under emperor Menelik II defeated Western imperialism and expanded to create its own empire. In many ways Ethiopia thus redefined itself. At that period, modern Egyptian nationalism was already in momentum; Arab nationalism was emerging; and so was Zionism. The Ottoman Empire was led as of 1908 by “The Young Turks”. The “Constitutional Revolution of Iran” of 1906-1911 left its marks. There were other new modern movements emerging in the regions under consideration, but they are too numerous to be mentioned here. 3The Ethiopian situation at that time was quite different but, for the sake of our argument, also similarly divided. There were two options for post-Menelik Ethiopia, and two rival leaders. Menelik’s heir, Lij Iyasu, was trying to build a decentralised system under a new set of loyalties. He relied on his father Ras Mika’el, a former Muslim who controlled a substantial army in the region of Wällo. He also had many contacts, including through marriages, with leaders of various groups in the south and the north.6 Dajazmach Tafari Makonnen was working to lead the old elite, the so-called Shoan establishment (as Shoa was the central region). It was the elite of the old, feudal system built by Emperor Menelik, which thrived on the legacy of proud independence, defeating western imperialism (the Adwa victory, March 1896), and controlling various provinces. Among the leading personalities were the Minister of Defense Fitawrari Habta-Giyorgis Dinagde, the head of the church, and Menelik’s close adviser Abuna Matewos, Ras Kaśa Haylu, and others. 4The general argument of this paper is that the global storm of the Great War had an enormous impact on all these movements, as well as on their internal rivalries. 5The Great War (as nobody at the time knew that it would be the First World War), was mainly European. It began because of the Europeans, and some ten millions of their young people lost their lives at this time. The war resulted in huge changes and painful consequences for the old continent. A secondary front of the war was opened in the Middle East. 6The war in the Middle East did not bring along such terrible spectacles of death. Nearly all of the battles during the four years of the war in the rough square drawn out by the Suez Canal, Mesopotamia (Iraq), the Caucasus, and the Dardanelles were carried out on the move, or comprised rapid breaches. There was hardly any cruel trench warfare in the region at all. Aside from few events, notably the Gallipoli campaign on the Dardanelles, the mortality rate among young people on both sides was incomparably lower than that in the West. Unlike in the West, though, suffering spread out among all parts of the population. Many suffered from the woes of war: hunger, morbidity, and mass forced conscription in Egypt for labour and the provision of ancillary services on far away fronts. Undeniable atrocities were suffered by various minorities, primarily the Armenians, whose terrible slaughter and annihilation at the hands of the Ottomans engraved the memory of the First World War in the region as an awful scar. Arab young men were barely sent to the killing fields. The Ottomans did not carry out mass conscription in their countries, and the Arab youngsters who were recruited were mostly sent far away to the Caucasian fronts. The British rulers of Egypt had long since taken apart the large Egyptian army that had been built up at the beginning of the 19th century, and its remaining units preferred to stay away from the lines of conflict. At its peak, the famous Arab Revolt in the desert did not involve more than 30,000 fighters, tribal and others. 7As the trenches in Europe prevented quick victories, generals and politicians on both sides thought they could score better in the Middle East. Two major strategic bridges of global importance attracted them to that region. These were straights of the Dardanelles and the Suez Canal. A third attraction was Mesopotamia (the future Iraq), the gate to the Persian Gulf as a source of oil. As the Young Turks led the Ottoman Empire against Britain, France and Russia, a war began on these vital bridges and in Iraq in 29 October 1914. A fourth front was opened in the Caucasus, where the Ottoman and the Russian armies shed each other’s blood, trading territories without either of them achieving a decisive victory. 8The war developed in three stages. First, the idea that daring operations could gain instant success proved illusionary. The British failed to storm the Dardanelles. The Ottomans, advised by the Germans, failed to storm the Suez Canal.7 The British progressed in Mesopotamia and were defeated. So were both the Russians and the Ottomans in the Caucasus. 10In early 1917, as the British advanced in Palestine and Iraq, a third stage began. The Soviet revolution in November and the exit of Russia from the war delayed matters, but in late 1918, the Ottomans finally collapsed. On 7 November 1918 the navy of the Allies sailed through the straights into conquered Istanbul. The Ottoman Empire, which had been the name and essence of the region for four centuries, was to be dismembered, and the new states of the Middle East were to be born. 11Throughout all the war years, diplomacy and propaganda were also conducted. The Ottomans declared an Islamic Holy War or “Jihad” on the Allies. On 7 November 1914 the imperial Shaykh al-Islām read it in public, loud and clear. The Ottomans, led by the “Young Turks”, Enver, Talaat, and Jamāl, thus thought to undermine the British in the region, as well as in India and elsewhere. The call for “Jihad” also had some effects in Libya (in early 1916 Sanusis invaded Egypt and were repulsed), Sudan (in Darfur Sultan ‘Alī Dīnār raised the banner of Islam), Somalia (to which we shall refer below), and Yemen (in the summer of 1915 an Ottoman army from Yemen failed to capture the vital British port of Aden). To the Arabs: the McMahon–Ḥusayn correspondence. It was an exchange of letters, as from July 1915, between the Sharīf Ḥusayn ibn ‘Alī, the head of the Hashemite family in Mecca, and Sir Henry McMahon, the British high commissioner in Egypt. Ḥusayn negotiated in the name of the Arab nation, McMahon in the name of the British government. The dialogue was in preparations for an Arab revolt against the Ottomans. No official treaty was signed, but historical promises were made in the correspondence. The British promised to recognise Arab independence after the war, but added conditions in a somewhat vague language. No maps were attached. The controversy about these promises never ended. To the Zionists: the Balfour declaration. It was promised to “view with favour the establishment in Palestine of a national home for the Jewish people”. And to the Egyptians, by declaring the Khedive a Sultan, and thus recognising Egypt a state of its own. 13The British also made secret promises to the French (the famous Sykes-Picot agreement9), promises according to which they planned on dividing the Ottoman Empire among themselves. 14The Ottomans’ failure to capture the Suez Canal made their call for an Islamic war in Egypt ineffective. Rather, the British turned Egypt into a major military base. At any given moment during the war, hundreds of thousands of British soldiers from all over the British Empire camped and trained in Egypt. The pressure on the Egyptian society, all of its classes, was heavy. Cotton crops were confiscated, basic food was seldom available. Hundreds of thousands of Egyptians were forced to join what the British elegantly called the “Egyptian Camel Transport Corp”, to carry on works in distant fronts. Full censorship was applied; political activists were exiled or escaped to exile. No more than five persons were allowed to gather in public. The Egyptians of all classes, pressurised and humiliated, accumulated rage. 12 The National Archives UK (NA), Kew, FO 371/2595, Thesiger to Grey, 23 Aug. 1916; HSBA, 44-46. 13 ASDMAEIASMAI, Colli to MAE, 11 Sep. 1916; NA, FO 371/2595, Thesiger to Grey, 14 Sep. 1916. 17If earlier, in April 1916, there was some logic in gambling on an Islamic-Ottoman victory in the Horn, it was now disastrously illusionary. By June 1916, as mentioned, the Arab Revolt in Mecca had started. Consequently, the Ottomans deserted Arabia and the Red Sea area. Only a small Ottoman garrison was left besieged in Al-Madina. Maẓhar Bey lost communication with Istanbul but he still worked to convince Iyasu to gamble on the Ottoman victory. Instead, on September 27 in Addis Ababa, with the encouragement of the British, Italian and French legations, the Shoan elite deposed Iyasu. Tafari was made ras and heir apparent. He would become Emperor Haile Selassie as of November 1930. 18The Great War ended with the collapse of four authoritarian empires. The Russian empire went first, still in late 1917, followed by the German, the Austro-Hungarian, and the Ottoman ones. Three parliamentarian powers (Britain, France and the USA) emerged victorious, with Italy as a fourth one. The Americans, led by President W. Wilson and his famous 14 Points, helped create the League of Nations. The new international organisation was based on the centrality of modern nationalism and on the concept of collective security. 19But President Wilson himself was defeated in the USA and the League remained dominated by the British and the French. Together with the Italians, they were now the occupiers of most of the Middle East and Northeast Africa. Under the auspices of the League, they divided the Middle East, creating the new entities of Iraq, Syria, Lebanon, Palestine, and Trans-Jordan. Still they had to find a compromise between their imperialistic interests and their recognition of local nationalist movements. The Mandate System was thus invented to legalise the British and French occupation of the aforementioned countries until after WWII. 20Egypt was not an inheritance from the Ottomans and its future was not to be determined by the League of Nations. As the war ended Egyptian public frustration erupted. The old guard of politicians formed a mission (Wafd in Arabic) to the peace conference in Paris to demand freedom. The British insisted on bilateral negotiations and exiled the Wafd leaders. This sparked “the 1919 Egyptian revolution”, a chain of riots out of which there emerged the Wafd Party.14 The Wafd was a combination of the nationalist militancy of Al-Ḥizb al-Waṭanī and the liberal parliamentarianism of Ḥizb al-Umma. It would lead the national struggle against the British occupation until the Nasserite revolution of 1952. 21Modern Turkish nationalism, which was much responsible for entering the war and losing the Ottoman Empire, was also responsible for saving Turkish independence. The story of Mustafa Kemal Atatürk mobilising renewed forces to build modern Turkey is not to be detailed here. Neither can we elaborate on the shattered hopes of Arab nationalists to unite in Damascus as of October 1918 and build an all-regional Arab state. The Zionist succeeded better in making the most of the Balfour Declaration. We shall only briefly return to the Horn of Africa. 22After the war ended the British had more time to deal with the Somali “Mawla”. The deposition of Lij Iyasu proved a blessing for him. In the new situation of Ethiopia under Christian hegemony and the British in control of the Red Sea, the isolated Muḥammad ibn ‘Abdallāh Ḥasan was too weak to be numbered. It was decided in London not to bother chasing him. Only in October 1919, long after the end of the war, the British decided to get rid of “The mawla”. At that moment they had new aircrafts capable of finding him in the desert and bomb him and his followers. 24Turning back to Ethiopia may provide a good perspective on the Great War in History. In Ethiopia, as mentioned, the war led to the demise of Lij Iyasu and his vision of the country, and to the rise of Tafari and his ambitions. This is of course not the place to discuss the role played by Tafari/Haile Selassie in Ethiopia and in its relations with the big world.18 His personality, we may state, contributed to the centrality of Ethiopia in global affairs (he himself appeared twice on the cover of Time Magazine in the inter-war period). 19 See for example the monumental book by Kershaw 2015. 25In recent years historians have tended to see World War I as just the first half of a continuous European story leading to World War II; claiming that the two World Wars were actually one long 20th century European catastrophe, divided by a twenty years intermission. There is more than a grain of truth to this approach.19 In any case, one of the links combining the two bloody chapters goes back to Ethiopia and its leader. The story is well known, but important enough to be readdressed. In 1923 independent Ethiopia was admitted to the League of Nations. Of all societies and of all the nationalist movements that arose in the pre-War period in the Middle East and the Horn of Africa already mentioned, only Iran (in 1920) and Ethiopia joined the League. Turkey remained independent as well after the war but, for reasons not to be discussed here, joined the League only in 1932. Iraq joined in 1932, Egypt in 1937 (both while still not really independent). All the others had to wait decades before gaining independence and being accepted as members of the international community. 26Ethiopia’s admittance to the League proved historically meaningful. Ras Tafari led in connecting Ethiopia to the West and to Europe. He believed that the League of Nations would defend all nations, big and small. In that he was wrong. By sacrificing Ethiopia to Mussolini in 1935, the British and the French enabled a vicious chain of events. It began with the demise of the League, the conquest of Ethiopia, the Spanish Civil War and then directly went to the Second World War. The apparently side-story of the Horn of Africa during World War I thus acquired a much greater global significance. Asfa-Wossen Aserate, 2014. Der letzte Kaiser von Afrika. Triumph und Tragödie des Haile-Selassie (Berlin: Propyläen, 2014) (English edition: King of Kings – The Triumph and Tragedy of Emperor Haile Selassie I of Ethiopia (London: Haus Publishing, 2015)). Del Boca, A. 1995. Il negus. Vita e morte dell'ultimo re dei re (Roma-Bari: Laterza, 1995) (English edition: The Negus, The Life and Death of the Last King of Kings (Addis Ababa: Arada Books, 2012). Erlich, H. 1994. Ethiopia and the Middle East (Boulder: Lynne Reinner, 1994). Erlich, H. 2010. Islam and Christianity in the Horn of Africa, Somalia, Ethiopia, Sudan (Boulder: Lynne Rienner, 2010). Erlich, H. 2014a. ‘From Wello to Harer: Lij Iyasu, the Ottomans, and the Somali Sayyid’, in E. Ficquet and W. G. Smidt, eds, The Life and Times of Lij Iyasu of Ethiopia: New Insights (Zürich: Lit Verlag, 2014), 137-145. Erlich, H. 2014b. Youth and Revolution in the Changing Middle East, 1908-2014 (Boulder: Lynne Rienner, 2014). Ficquet, E. and Smidt, W. G., eds, 2014. The Life and Times of Lij Iyasu of Ethiopia: New Insights (Zürich: Lit Verlag, 2014). Gershoni, I. 1986. Egypt, Islam and the Arabs: The Search for Egyptian Nationhood, 1900-1930 (New York: Oxford University Press 1986). Jardine, D. J. 1923. The Mad Mullah of Somaliland (London: H. Jenkins, 1923). Kershaw, I. 2015. To Hell and Back. Europe, 1914-1949 (New York: Viking, 2015). Mohamed Osman Omar, 2001. The Scramble in the Horn of Africa. History of Somalia, 1827-1977 (New Delhi: Somali Publications, 2001). 2 When the Italians invaded the Ottoman regions of Cirenaica and Tripoli in 1911, the locals were already long led by a popular Islamic movement, the Sanūsiyya. It had been established in 1843 by the scholar Muḥammad ibn ‘Alī al-Sanūsi, and spread popular-Orthodox Islam among tribesmen. Facing the invaders, Sayyid Aḥmad al-Sharīf al-Sanūsi led the resistance, and the movement proved more effective in the desert hinterland. When WWI broke, the Sanusis, supported by the Ottomans, scored some victories and even invaded British-occupied Egypt. In 1916 they were pushed back and the British helped Sayyid Muḥammad Idrīs al-Sanūsi take control. He reconciled for a while with the Italians, but led the Libyan national struggle for independence after the war. After WWII in 1951, Muḥammad Idrīs al-Sanūsi was crowned king. He was deposed by Mu’amar al-Qaddhāfī in 1969. 3 The Mahdiyya was a movement of messianic, radical Islam which managed to unite most of the Sudanese people against the Egyptian occupation (which began in 1821), and to establish an independent state from 1884 to 1898. Led first by the “Mahdi” Muḥammad Aḥmad (up to 1885) and then by his successor, the Khalifa ‘Abdallāh al-Taishi, the Mahdiyya was committed to spreading its kind of radical Islam as well as fighting British and Ethiopian “infidels”. The Mahdiyya was destroyed in 1898 by an Anglo-Egyptian army, and Sudan came under the British, who had occupied Egypt (1882). Like the Sanūsiyya, which was not radical, the Mahdiyya was a religious-political movement motivated by Islamic universal concepts, but it ended being a formative experience in terms of separate national identity for Sudan. The same was true of the Wahhābiyya in Arabia, which also ended as the ideological-historical source of modern Saudi-Arabia. 4 Somali-speaking people have enjoyed little unity throughout history. Their tribal (clannish) social structure was quite fragile; their Islam was popular and often apolitical. In the last quarter of the 19th century they were conquered and divided by the French, the British, the Italians, and the Ethiopians. The more effective effort to unite them was led by Muḥammad ibn ‘Abdallāh Ḥasan (1864-1920), whom the British nicknamed “The mad mawla”. In 1895 he returned from Islamic studies in Mecca and began preaching the holy war against the occupiers, as well as against the local popular Islam (primarily the Qādiriyya brotherhood) and its permissive culture. “The mawla” was originally from Ogaden, a territory occupied by the Ethiopians. Liberating Ogaden became his primary objective, which he never achieved. He was somewhat more successful in uniting some of his people and in keeping the struggle, avoiding British and Ethiopian efforts to catch him. “The mawla” was a great poet, charismatic, and not entirely free of corruption. As of 1912 he sided with the Ethiopian heir of Emperor Menelik, Lij Iyasu, who was of Muslim origin. When WWI broke “The mawla” joined the Ottoman call for “Jihad”. Many among the Somalis see him as the modern father of their nation. 5 Both parties were established in 1907 by two of the most prominent leaders of modern Egyptian nationalism. They both began their way as students in the Law School of Cairo and, at that time already, launched newspapers. Muṣṭafā Kāmil (1874-1908) also spent years in Paris before returning to Cairo and joining his friends to establish Al-Ḥizb al-Waṭanī. In his many articles, mainly published in his newspaper al-Liwā’, as well as in public speeches, Kāmil preached Egyptian active patriotism. It was ideologically based on Islamic-Christian cooperation but also on identification with the all-regional Ottoman Empire and its Islamic heritage. Kāmil and his ideology, including the call to actively resist the British occupation, was more popular with the young generation. His premature death in 1908, at the age of 34, shocked the Egyptian public. His funeral was in fact the first meaningful mass demonstration in modern Egypt. Aḥmad Lufti al-Sayyid was two years older and lived to reach the age of 91. He would become the president of Cairo University and win the prestigious reputation of “philosopher of the generation”. In his many articles and books, Aḥmad Lufti al-Sayyid preached the emancipation of the mind as prior to political militancy and deepening Egyptian unique identity as derived from the pluralist history of the country. He stood for Egyptian independence as part of the liberal world, and obtaining independence gradually through education, progress, and non-violent diplomacy. 6 For more detailed insights on Iyasu's rise to imperial power and the evolution of political affairs under his short reign, see the volume edited by Ficquet and Smidt (2014). 7 The Ottomans’ idea to surprise the British and occupy the Suez Canal led to one of the daring operations in the Middle East, just like the British campaign to capture the Dardanelles (the battle of Gallipoli, March 1915-January 1916). Both campaigns equally ended in failures. Occupying the Suez Canal, or damaging it by sinking a few ships, could deal a strategic blow to the British. The Canal was a main communication link between the British colonies and allies in Africa and Asia and the war fronts in Europe. Egypt was the major British base outside of England itself. Soldiers from Australia, New Zealand, India, and Africa used to camp and train in Egypt. Twenty-five thousand strong Ottoman forces crossed the Sinai Desert and reached the Canal on 31 January 1915. But despite the effect of surprise, the forces lost some 1,500 men; its only success being a daring retreat back to Palestine. The Ottomans’ hope that the very appearance of their soldiers would ignite an Egyptian revolt against the British failed as well. In July-August 1916 the Ottomans tried to capture the Canal again, but once again failed. Thus the road of the Ottomans to Egypt, and from there to the Red Sea, was blocked. The main result of the Suez operations was convincing the British that in order to defend Egypt and the Canal, the backbone of their Empire, they also needed to control Palestine, as they indeed would after WWI. 8 The military significance of the Arab Revolt consisted in diverting substantial Ottoman forces to that front, in denying them access to the Red Sea, and in achieving some symbolic victories in a period of stalemate. The historical importance of the Arab Revolt in the desert was mainly ideological-political. The fact that the Hashemite, the family of the prophet, declared war against the Ottomans was a proof that the Ottoman declaration of holy war was illegal and hollow in the eyes of many. Many Muslims, mainly from India, fought on the side of the British (especially in Iraq), and this was a vital issue for them. In October 1918, as the Ottoman army collapsed, the British enabled the army of the Arab Revolt, led by Fayṣal the son of Ḥusayn, to enter and control the ancient capital of Damascus. The declared Arab government, claiming to lead an all-regional Arab state, was destroyed by the French in July 1920. 9 Russia was also a party to the secret diplomacy of the Allies. It was agreed in April 1916 that after the victory over the Ottomans, Russia would annex a huge territory in today’s Turkey, and in fact control the Dardanelles. W. Churchill called it “the greatest prize of the war”. But it was never given, as Russia abandoned the war following the revolution of November 1917. 10 This section summaries my article Erlich 2014a, 137-145, which is based primarily on British, Italian and Turkish sources. See more details in Erlich 1994, 83-91. 11 Archivio Storico Diplomatico del Ministero degli Affari Esteri e della Cooperazione Internazionale (ASDMAECI), Roma, Archivio Storico del Ministero dell’Africa Italiana (ASMAI), 65/11, ‘Memorandum della Legazione Britanica in Addis Abeba’, Jul.-Aug. 1916. 14 Four months after the end of WWI, Egypt erupted. The immediate background was the attempt by some of the established leaders to present the standpoint of Egypt at the Paris Peace Conference. Primary among them was Sa‘ad Zaghlūl, a statesman in his sixties who was leading the diplomatic national struggle at that time. Zaghlūl took charge of organising the Egyptian delegation Al-Wafd al-Misrī to London (and from there, they hoped, to Paris), but it was blocked by the British and its members were arrested. On 9 March 1919 when the arrests became public, students from the Law School (who had been busy recruiting members for the Wafd) declared that they would no longer study law in a place that ridiculed the law. On this very day, their strike spread to other colleges, and students quickly set out on protest demonstrations organised by student-led committees. It did not take long for the flame of protest to spread to other provinces in Egypt, there carried by high school students. A strike by high school students in the city of Ṭanṭā on March 12 was the signal. Over the next few weeks, the Egyptian Revolution raged violently, encompassing all parts of the population, and claiming scores of lives. Throughout the country, new committees that oversaw and encouraged the revolution, including the destruction of transportation routes and telephone lines, arose out of the riots. The violence reached its peak on March 18, when eight British officers were murdered on a train from Suez to Cairo. In April the British agreed to open negotiations with Zaghlūl and his people, and the riots died down. They finally came to an end with the onset of the summer heat, when the students dispersed for their vacation, returning to their homes and their villages. For more on the Egyptian Revolution of 1919, see Gershoni 1986, 40-54. 17 Mohamed Osman Omar 2001, 474-475, quoting Claud Russell’s report, a copy in the National Archives of India, New Delhi, Foreign and Political Department, External, File 740, 1-7, 1923. 18 The best biographies of Haile Selassie are: Asfa-Wossen Aserate 2014 and Del Boca 1995; I am now completing my version of Haile Selassie's life, focusing on analysing the dynamism between his authoritarian rule at home and his relations with the outside word. ERLICH, Haggai. WWI in the Middle East and Africa: Nationalist Movements in a Formative Age In : The First World War from Tripoli to Addis Ababa (1911-1924) [en ligne]. Addis Abbeba : Centre français des études éthiopiennes, 2018 (généré le 20 avril 2019). Disponible sur Internet : <http://books.openedition.org/cfee/1081?mobile=1>. ISBN : 9791036523786. DOI : 10.4000/books.cfee.1081. Erlich, Haggai. “WWI in the Middle East and Africa: Nationalist Movements in a Formative Age”. Shiferaw Bekele, et al.. The First World War from Tripoli to Addis Ababa (1911-1924). Addis Abbeba : Centre français des études éthiopiennes, 2018. Web. <http://books.openedition.org/cfee/1081?mobile=1>. SHIFERAW BEKELE (dir.) ; et al. 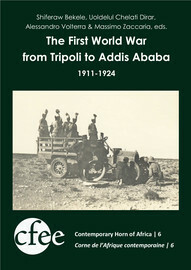 The First World War from Tripoli to Addis Ababa (1911-1924). Nouvelle édition [en ligne]. Addis Abbeba : Centre français des études éthiopiennes, 2018 (généré le 20 avril 2019). Disponible sur Internet : <http://books.openedition.org/cfee/1024?mobile=1>. ISBN : 9791036523786. DOI : 10.4000/books.cfee.1024. Shiferaw Bekele, et al., ed. The First World War from Tripoli to Addis Ababa (1911-1924). Addis Abbeba : Centre français des études éthiopiennes, 2018. Web. <http://books.openedition.org/cfee/1024?mobile=1>.